MagicPlot provides accurate typography in text labels and axes labels. You may toggle some features in 'Typography' tab of MagicPlot Preferences. MagicPlot supports Latin ligatures in text labels. If you type 'fi', 'fl', etc., those symbols will be shown with ligature glyphs when you exit edit mode. Not all fonts contain ligature glyphs. MagicPlot displays ligatures only if the glyphs are included in used font. You can turn the ligatures off in MagicPlot preferences. The numbers in scientific notation need two special characters if you want the typography to be accurate: minus sign and multiplication sign. 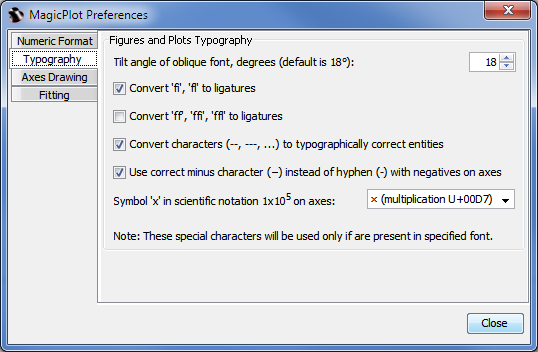 Many graphing software applications which use simplified typography use letter 'x' and hyphen-minus (-) in numbers instead of typographically correct special characters. This simplified typography was mainly used in old applications which do not support Unicode. MagicPlot can use either correct symbols (default) or simplified. You can change this option in MagicPlot Preferences. When you edit some text, keyboard minus key enters hyphen-minus character. The correct minus character can be typed in text label by pressing Ctrl+M, -, see Inserting Special Symbols for details. In different languages, multiplication signs differ. In most cases you have to use either '·' or '×' sign. You also can specify any special character or character sequence, for example enter spaces before and after multiplication signs.